Kuijp, Leonard W.J. van der, Arthur P. McKeown (2014). 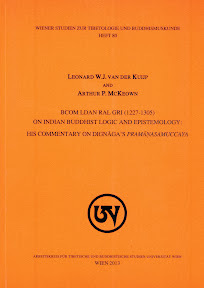 bCom ldan ral gri (1227-1305): On Indian Buddhist Logic and Epistemology; his commentary on Dignāga's Pramāṇasamuccaya. Wiener Studien zur Tibetologie und Buddhismuskunde; 80. CV, 219 S.